My twin sister and I LOVE anything Disney. We love to help plan or answer any questions about Disney. Le Cellier is a Must Do! Last October was the first time we ate at Le Cellier and it was wonderful!! We made our reservations 180 days out for our late lunch, and I am so glad we did. As we waited to be seated we watched several people try to get a table without a reservation with no luck. As we walked back to our table we noticed it was rather warm in the dining room. Our waiter quickly brought over waters and explained that the air conditioner went out and they were working on fixing it immediately. Within 15 minutes it was on and cooling perfectly! For starters we ordered a Magical Star Cocktail and some Cheddar Cheese Soup. Yum! For our entrees it was steak all around! I had the Mushroom Filet Mignon everyone else got the New York Strip. I can honestly say I think it was the best steak I have ever eaten! So stuffed we still had to order dessert! I had my heart set on the Maple creme brulee, but once we got the menu I quickly changed my mine to the Chocolate Pecan Pie "On the Rocks". Our waiter told me that if I finished the Pecan Pie he would get me something special! Needless to say it was so rich and wonderful there was no way I was going to eat the entire small glass full of goodness! All in all Le Cellier is wonderful and we will be dining there again! Today we went to see Silver Linings Playbook. 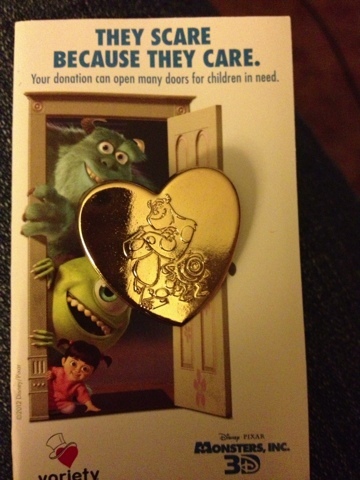 While purchasing my ticket I was asked to donate $3 and get a Monsters Inc. pin. Sure!! When I got home I read the card on this GREAT charity! Variety grants kids mobility equipment for children with disabilities, increasing their independence, confidence, and self-reliance! While combing through Facebook one day I came upon the magical Disney World Personal Shopper. After browsing all the different things to purchase, which is an amazing selection, I noticed what I wanted was not there. After sending them a message on Facebook, Amy & Elizabeth emailed me back very quickly! They would go in the park and get items that I so desired! After only a few days I received another email from Amy & Elizabeth letting me know they got my magical items along with my invoice for my things. Paid with Paypal and now my items are on there way! I'm so excited I just had to share my MAGICAL experience. This was my first purchase and definitely will not be my last! Please go check out there page! My boys had an AMAZING time parasailing over Bay Lake! Sammy Duvall's Watersports was great! Highly recommended! Check out the Test Track Side by Side Comparison.